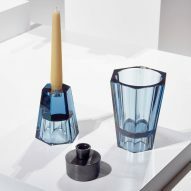 The latest Home range from Swarovski includes bottle stoppers, polygonal paperweights, and marble trays decorated with slices of brightly coloured crystal. The homeware collection, which was shown at Palazzo Crespi during Milan design week, includes several new pieces as well as additions to existing lines. 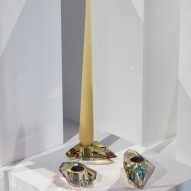 American designer Barbara Barry created a set of modular candle holders, which pair crystal bases in various colours with brass centrepieces that are designed to bring "intimate warmth" into the home. Icelandic-German design duo Studio Brynjar & Veronika – who were awarded the Swarovski Designers of the Future Award in 2016 for their rainbow-casting crystal blinds – has contributed a range of prismatic paperweights. Made of rods of crystal in contrasting hues, the paperweights cast coloured reflections. 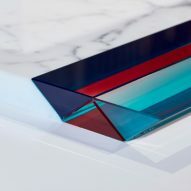 Colour also features in Tomás Alonso's trays, which are an addition to his existing Atelier Swarovski Home Prism range. Pieces of marble are ringed with patterns made from chips of coloured crystal, or intersected by stripes in contrasting hues. Dutch designer Aldo Bakker has also expanded his Facet range, with a series of bottle stoppers in muted colours and a set of paperweights. Architect Andre Kikoski paired Swarovksi's trademark material with copper and nickel to create a collection of perforated and textured boxes topped with chunks of crystal. 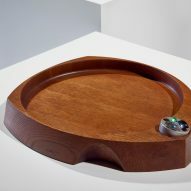 American designer Greg Lynn's set of trays and cups, which contrasted turned wood with gems made from cut crystal, are aimed at those lucky enough to have a bar at home. Swarovski launched its first Atelier Swarovski Home range in 2016, "to address a global interest and customer demand for design objects within the home". Its debut collection included colour-hatched bowls by Raw Edges and a crystal and metal centrepiece designed by the late Zaha Hadid. The brand just made Dezeen Hot List – our data-driven power list of architects, designers and brands – coming in at number 214. Other highlights from Milan design week this year included a range of furniture by Marni, which was woven using a traditional Colombian technique, and a collection of surreal rugs designed by Jamie Hayón for Nanimarquina.